On a world cursed to be covered in clouds, protected by the elite Rift Riders who fly on the backs of giant eagle miryhls, Lady Mhysra Kilpapan and her friends are making history. Women are now firmly back within the Rider fold and the future looks bright. 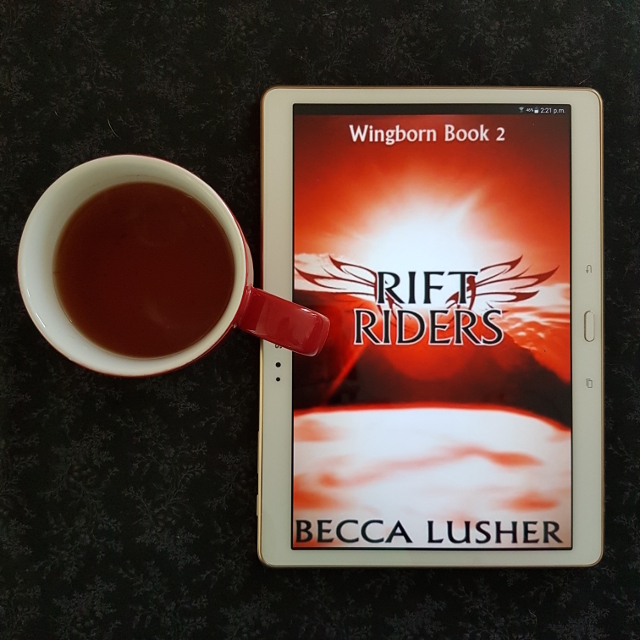 But even though Mhysra and her Wingborn Cumulo have survived their first year as students, there’s more to becoming a Rift Rider than lessons and training. Especially when trouble is brewing in the Wrathlen and the kaz-naghkt are looking for revenge. Return to the Overworld for the next exciting Wingborn adventure, where strength, loyalty, honour and friendship are about to tested to their limits and beyond. I am a huge fan of the Wingborn series. What’s not to love about a magical Regency-influenced society where the military ride giant eagles? Wingborn did an excellent job of setting up that society: showing the bond between rider and eagle, as well as the expectations the upper class have of their children. Rift Riders takes that and shakes it up. Now that the world has been established, a serious threat steps forward. Yullik, a man with mysterious powers, manages to unite the pirate captains of Wrathlen for the first time in history. Allied with savage draconoids, the kaz-naghkt, they may prove unstoppable–even for the Rift Riders. This new threat builds great tension and raises the stakes. It also makes Rift Riders quite a different book to its predecessor. The more domestic aspects of the story, such as society life and the Kilpapan family dynamics, are left behind in favour of a more traditional epic fantasy narrative. While this was slightly disappointing, the transition works well, with Rift Riders becoming more of an ensemble piece. Mhysra remains an important part of the narrative, but her friends get a greater share of the spotlight, with a few stepping forward to become point-of-view characters. This enables us to see more of what’s going on, particularly when battles break out on several fronts. The relationships between these characters remain a strength of the story. The groundwork for a few romances was laid in the previous book, but this are dialled back or absent entirely. Instead, the focus is on friendship and duty. Mhysra and her friends do their best to support each other as they struggle to survive and defend the realm. The banter between them is never entirely absent, lightening what could otherwise be quite a grim story. Nor is this friendly teasing limited to the students–Lieutenants Lyrai and Stirla are equally as bad. Managing such a cast of characters can be a handful, but the story does an excellent job of reintroducing everyone in the beginning. It does so through a tight action sequence which handles both aerial and ground-based combat in a way that sets the tone for the rest of the novel. All in all, Rift Riders was a delight to read. With at least one more novel to come, and with the shift of tone between books, I’m curious to see what is in store for the remainder of the series.